Once you have submitted your order, we will email you (within 24 hours) to request all of the necessary information from you. Please check your spam folder if you don’t see the email. Our aim is to get your first email blast sent out within five business days. Our very popular email blast will send out your music to roughly 100,000 contacts. These contacts include hip hop fans, label execs, A&R’s, talent seekers, booking agents, managers, producers, magazines, media, radio stations, etc. The most important contacts on our list are the hip hop fans – potential fans of your music. If you want to be successful as an artist, you have to have a strong fan base. 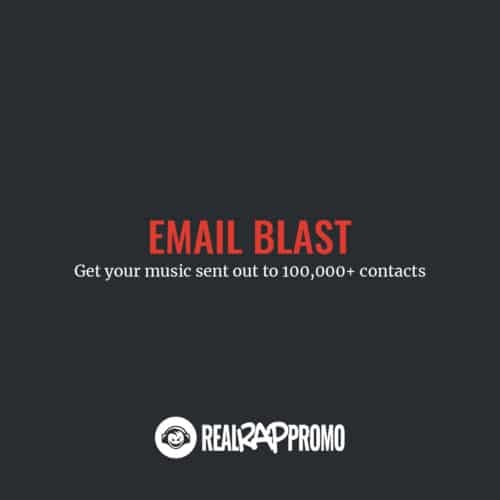 But, whether you want to gain new fans, or be introduced to important industry contacts, our email blast is the perfect solution for you. With 100,000+ hip hop related contacts on our email list, our email blast is an extremely cost-effective way to quickly get your music out to a huge audience.